Under $250 Holiday Gift Idea! If you or one of your beauty loving friends has yet to experience the magic that is La Mer, then this is the perfect holiday gift choice. Yes, it's a luxury purchase, but one that will make a noticeable impact on the skin that makes it worth every penny in my book. I love this set because it features three of La Mer's best and most powerful products and, because the sizes are smaller, they allow you to experience multiple products for a lower price, and travel with them. The limited edition LaMer Signature Collection features: Crème de la Mer (1 oz. 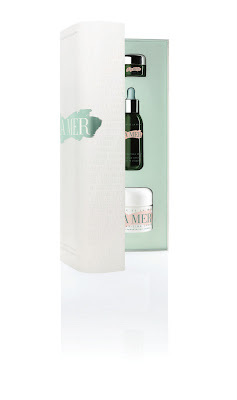 ), The Lifting Face Serum (15 ml) and The Eye Concentrate (5 ml), The Signature Collection lets your loved ones indulge in La Mer at home or away. Oooh...La Mer. I think I dream of La Mer at night. One day I will be able to try it! ; ) what's your personal fav from La Mer? Yes, Helena, they have foundation, loose powder, powder foundation and concealer. The best way to get samples of their Skincolor products is to purchase at least 1 item from a La Mer counter (or online where they do offer 2 samples w/your purchase, but they rotate skincare/skincolor products). Usually most counter SA will have several different LaMer samples which they give out to customers. If they don't have it the first time you go - just follow up with them - they are generally very accomodating.